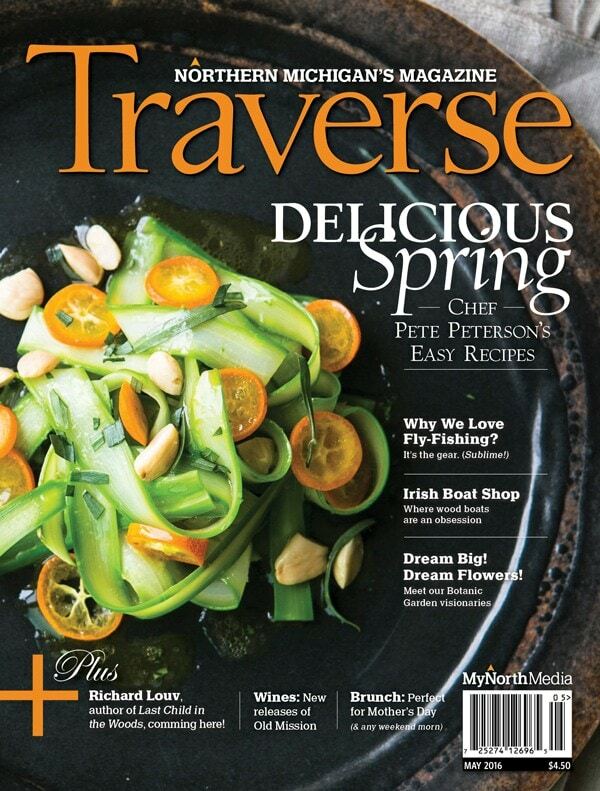 Renowned Traverse City Chef Pete Peterson shares some of his favorite spring recipes with Traverse food and wine editor Tim Tebeau. On the stove, handfuls of fiddlehead ferns and wild leeks quickly blanche in a saltwater bath, while pancetta lardons render on an adjacent burner. The chef himself carries an electric air of rejuvenation as this particular spring sees the launch of Alliance, Pete Peterson’s new 40-seat restaurant venture with talented local chef James Bloomfield. Today’s cooking, however energized by the thrill of new beginnings, is also driven by old favorites. Peterson is delving into the playbook from Tapawingo, his iconic eatery that helped shape the North’s regional cuisine, to share his story and to teach us to cook with the quaternary of wild spring edibles: morels, ramps, asparagus and fiddlehead ferns. Following his gastro-epiphany, Peterson resigned from Ford, but before liquidating he called Wes Westhoven at Ellsworth’s Rowe Inn and offered to spend a few weeks working for free to get a better taste of la vie culinaire. Peterson spent the next six and a half years honing his craft at The Rowe before opening Tapawingo, a converted summer cottage on seven acres—also in Ellsworth—in 1984. Peterson cultivated a close relationship with American Spoon Foods founder Justin Rashid, who helped network the chef entrepreneur with local farmers and foragers to build his seasonal supply chain. Before long Tapawingo was heralded as a destination eatery by Bon Appétit, Gourmet magazine, The Chicago Tribune and The New York Times. As Peterson’s menus evolved to capture and celebrate the seasonal ebb of ingredients in Northern Michigan, it was always the arrival of spring edibles that excited him most. “All of a sudden we’d have these wild green vegetables and earthy morels to work with, and the guests couldn’t get enough of it,” Pete recalls. He notes that the restaurant continually, and futilely, raised the price of its signature gratin of morels, fiddleheads and asparagus in an effort to control the demand. To the dismay of his devoted diners, Peterson closed Tapawingo in 2009. Preparing these signature dishes today at his well-equipped home kitchen in downtown Traverse City, Peterson stresses minimalism when cooking with wild edibles, especially morels. “You want to extract the flavor of the mushroom as purely as possible to showcase its special earthy flavor.” Butter, shallots, cream, chicken stock and sherry are the ideal building blocks for morel preparations, Peterson asserts. Accompanying proteins should be equally subtle: preferably veal, chicken or trout. Dried morels have more intense flavor for amping up the umami in soups and sauces and may also be powdered and incorporated into pasta dough. A mixed skillet of white and grey morels sauté slowly in butter as Peterson addresses the green components in this spring meal’s mise en place. “Blanching these green vegetables for one to two minutes in salted boiling water and then shocking them in an ice bath is very important for their color and texture,” Peterson says. He transfers tender-crisp asparagus spears, ramp greens and tightly coiled fiddleheads from hot pot to cold plunge. In addition to paring away the tough base, Peterson also advocates peeling asparagus before blanching to remove the fibrous outer skin. Trimmed, peeled and blanched, one of Peterson’s favorite asparagus expressions is to toss them lightly in high quality olive oil. “They take on a beautiful shine,” he says. Serve them as an hors d’oeuvre with orange zest–infused aioli for dipping. Alternatively, the tender tips can be saved for sautés and the stalks cut into translucent strips for spring salads using a razor-sharp mandolin or vegetable peeler. With a designer’s eye, Peterson scatters the green helixes of sautéed fiddlehead ferns over nests of pappardelle pasta studded with crispy bits of pancetta and finely grated Parmigiano. These tender, curled shoots of the ostrich fern are typically concurrent with morel season and mostly found along the riverbanks, streams and low lying swampy areas. As he does with asparagus and ramps, Pete prefers to clean, trim and blanche the fiddleheads before sautéeing them lightly in butter with ramp greens and morels, baking them in a light gratin or tossing them in pasta or risotto dishes. The oven door slides open to relinquish bubbling ramekins with tawny gratinéed crust and baking sheets of crisp morel flatbread. The earthy, intoxicating vapor of mushrooms suffuses the air, while on the table shockingly green salads of sliced asparagus, ramps and wild watercress offer a first taste of the warm months to come. The excitement and anticipation over this first feast of spring is palpable, and the delicious wild bounty disappears in relished bites. For Peterson, this meal marks another season in his career, where the flavors of the North’s spring woods and summer fields will find new expression in the hands of a dynamic young chef, an alliance of legacy and innovation. This feature on Pete Peterson was originally published in the May 2016 issue of Traverse, Northern Michigan’s Magazine.